In the following marketing piece, we look at the launch of Nonstop Chuck Norris and the quest to create a joined-up advertising, PR and influencer campaign that positioned the unstoppable force that is Chuck Norris at the heart of the story. The quality of your creative output and the power of your story are two of the most critical areas of focus for a PR pro. If you can’t explain your story in one sentence (what can be called the “hyper elevator pitch”) or grab the attention of a journalist or potential player in the first seconds of a video, you really have a long campaign ahead. One of the biggest mistakes you can make when promoting a game (and this is written with first-hand experience!) is to try and be too clever, bombarding your audience with overly complex and truncated statements that don’t accommodate for the speed with which social media users consume information in 2018. So the trick is: keep it simple. Create a story that is easily digestible and can be explained by your good self in one sentence to whomever puts you on the spot, whether that’s a company director in a meeting, or a journalist at a trade show. Also: make sure to sanity check that your story is a perfect fit for the product. It’s great being creative, but if your story is totally random and not aligned to the game’s core themes, this is another immediate red flag. But once you’ve validated all this, it’s time to build your story and piece together your different video and written elements around a central story that combines your entire PR, influencer and broader brand marketing campaign. With Nonstop Chuck Norris, we were very fortunate to work with Mr. Norris in person, with the chance to leverage his status as action hero and Internet legend. It was clear from the beginning that this campaign needed to be slightly off the wall and in line with the power of Mr Norris’ brand. After all, Nonstop Chuck Norris is all about harnessing his unstoppable power and assuming the role of his sidekick (after all: no-one plays Chuck Norris! ), assisting him as he travels through multiple universes while battling infinite hordes of villains. Thanks to some incredible creativity by the game’s developers, Mr. Norris is equipped with wacky weapons like foldable chairs, chainsaws and even selfie sticks, while a lot of the in-game collectibles riffed off famous Internet memes about the superhuman powers of the man himself. 1. Mr. Norris is driving this marketing campaign, and we’re playing by his rules. 2. All the inspired in-game content was the inspired work of Mr. Norris himself! From day 0 therefore, we began to build out the campaign storyline around this central premise. Now let’s breakdown some of the core executions and discuss how they centred around the “It’s MY game!” tagline. With the game set to release in mid-April, we knew that with backing from such a recognised IP, we were safe to start rolling out our campaign without saturating the audience or running out of engaging content. At the end of January the shoot for the main trailers had been filmed, executed by the creative masterminds at Novafilm and Volta. The initial reveal needed to pack a punch and deliver a fun insight into the dynamic between the game makers and the boss. With live action reveal trailers at this stage of the campaign, it’s also important to introduce the game concept but not dive into too much detail. That can all come later on. 10th March is an important day — it’s Chuck Norris’ birthday of course. This represented perfect timing for us to unveil the game, with Mr. Norris agreeing to publish the reveal trailer across his highly-engaged social communities. Thanks in addition to support from media outlets such as Mashable, Yahoo and Mirror Online, the trailer racked up a couple million views in the first days of it going live, providing a great springboard for the rest of the campaign. With the game going live for pre-registration, this gave us a strong platform to build around when counting down to the game’s global launch. Green light for global release! Therefore aside from the slight deviation re: the above meme reaction video, we’d worked hard to ensure the messaging remain clean and simple, and that the videos had a clear narrative continuity. When devising a marketing campaign around a central story, it’s vital to consider when and how to involve the community, bringing them into the fun. In the lead-up to launch we’d released a “GIF generator” and given fans the tools to create their own custom Chuck Norris memes, awarding the best ones via a competition staged on Twitter. Yet this wouldn’t be enough to drive mass engagement, which is the point we started to consider our approach with influencers. 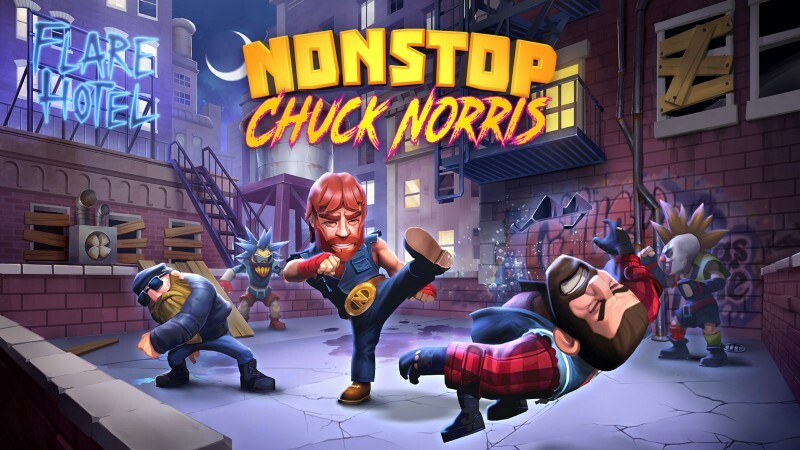 With Nonstop Chuck Norris being a game meant for quickfire gameplay sessions, we’d ascertained that to create engagement with our influencer partnerships, we needed to find a way to involve them in the story and most importantly, put them in direct contact with Mr. Norris. This was the philosophy behind the “Chuck Challenges”, a series of recorded video messages and social media posts published by Mr. Norris to some of the Internet’s biggest stars, calling them out and instructing them to do his bidding. 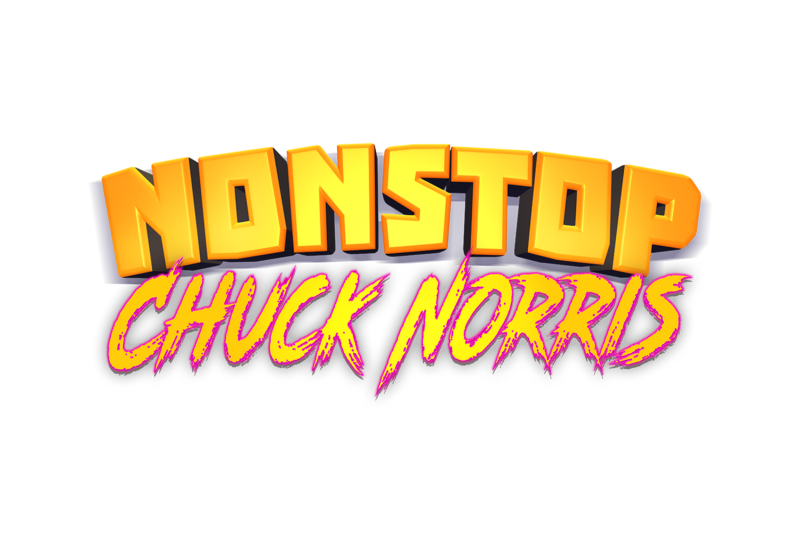 To increase the significance of the “Chuck challenges”, we then iterated on the concept by making the conversation more two-way, with Mr. Norris calling out influencers to create new items for his game. In short, this was a critical part of the campaign to open up the “It’s MY game!” concept and further its use beyond a couple of nicely produced trailers. With the game surpassing 1.5m downloads in its opening weekend and the launch campaign in full flow, the last major storytelling beat of the campaign was to round off the “Chuck Challenge” concept with an in-person event. The vision for this was to take some of the biggest social media stars resonating with our target audience, and putting them face to face with Mr. Norris at his home. Supported by the excellence of the guys at social agency Delmondo, Internet stars such as Ross Smith and David Dobrik travelled across to the event, participating in what we called the “Chuck Bootcamp”. The key driver of this activity was to maintain the traction we’d achieved from the launch campaign and the game’s App Store and Google Play featurings, but now expand the targeting to expose the game to an even broader audience. One critical point to close this piece is that the “It’s MY game!” story for this marketing campaign carried with it a playful wink to the audience at all times. Although it would have been cool, it’s clear Mr. Norris wasn’t actually leading the production and promotional efforts for the game! And that’s an important note when creating the messaging for a marketing campaign — be genuine and involve your audience, rather than trying to fool them with false messaging. And as alluded to in a recent piece by flaregames brand manager Sylvain, know your audience in depth when telling your story. Because of the audience insights we received when planning this campaign, we were confident the “It’s MY game!” storyline would resonate with the target audience. – before kicking off: ensure you can distill your campaign message into one sentence. – keep it simple — you have mere seconds to convey your message and impress an audience. – keep it relevant to the product — be creative but stay true to the game. – involve the audience at all times — never try and fool them.